Another famous view of a Castle, this time Kilchurn Castle, the two views of the castle are taken from each side of the Loch. 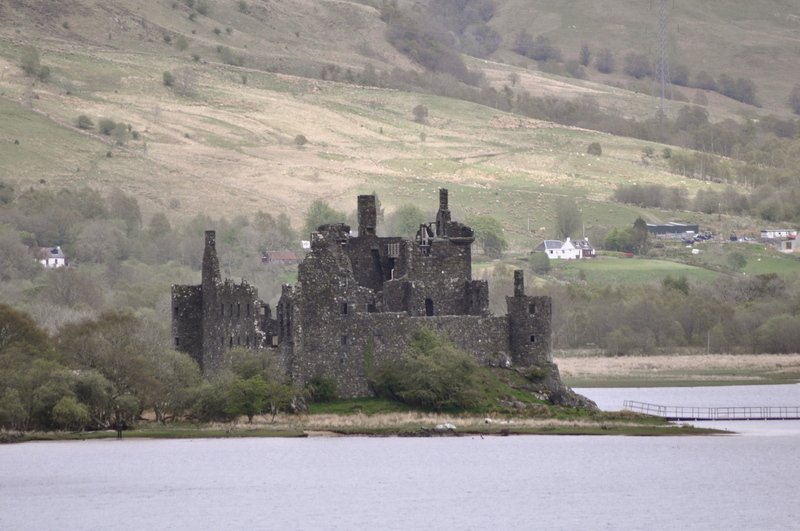 But what is not widely known is that there are four castles on Loch Awe, but apart from Kilchurn Castle, the other three are like hunting a needle in a haystack. 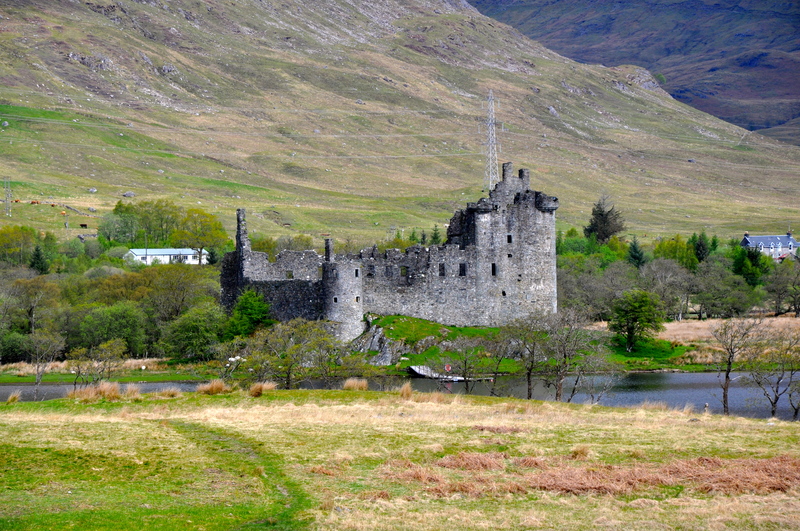 Kilchurn Castle is dated 1450 and started life of as a five storey tower house with a courtyard. By the 17th century it was a military barracks and in 1760 it was damaged by fire and abandoned. Innis Chonnel Castle stands on a small rocky island and from the road you can hardly see the building, in fact we had driven past when I suddenly said stop….I have been doing a lot of that this holiday….I realised that I had seen a wall through the trees. The trees were so thick that I could not get a good photo with out scrabbling down a steep incline, I managed a corner of the castle and then drove down to the loch side and took a photo of the island, you can see one corner of the castle on the left. The first photo is Fincham Castle dated 13th century, the castle is on private land, next to Fincham Farm about a mile from Ford Village. There are only some sections of wall left. Legend says that the castle burnt down, shortly after being finished, by two rival families and was never really inhabited afterwards. The other photo is of Fraoch Eilean Castle 13th century and stands on an Island in the middle of the loch. I could show you a photo of the Island but you can’t see the castle for the trees, so I found a photo of each of the castles so that you can see a little of them. Loch Awe is a lovely Loch to drive around and is over 25 miles in length and is the longest stretch of freshwater in Scotland. Legend has it was created by a witch and lived in by an evil monster even more fearsome than the one in Loch Ness. Thank you we had a wonderful time and we even got some sunshine. There will be a lot of photos of Scotland as there are so many castles, Islands, gardens and of course churches that you just have to take photos of, all in wonderful settings. Lovely photos – these ruins look incredibly atmospheric. Just catching up after a few days away – oh and the memories of the midges at Loch Awe! The photos are Beautiful! I have just returned from there and absolutely fell in love with the highlands! Do you know the name of the castle that you can see on the right bank if you are standing facing the lake? I had forgotten to ask the tour guide about it! Great photos. Love Kilchurn Castle. Classic late medieval/renaissance fortified dwelling. Full of atmosphere. It’s a bit out of the way (in the woods by Killin) but can be combined with a trip to Menzies Castle in Weem, near Aberfeldy at the other end of the Loch. There’s also the (still in use) “tin tabernacle” a corrugated iron church in Killin. So impressive! 🙂 I so want to visit!